This Card was inspired by Christina! 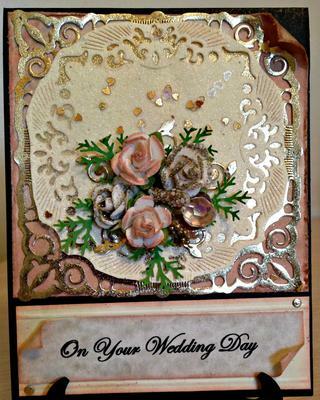 I Love her elegant cards and love creating and making cards. Sometimes just to craft and other times for others, with them in mind. I made this card for my niece's Wedding this past November. Their Venue was in one of Winnipeg's oldest and most prestigious Hotels. I just thought it would be so fitting for her day. Tim Holtz distress ink Tattered Rose to make it look more vintage. This Card was inspired by Christina! I Love her elegant cards and love creating and making cards. Sometimes just to craft and other times for others, with them in mind for certain occasions. Then die cut another piece of card stock using the Bow Elegance die from Spellbinders, die #2. Place ribbon around 1 st cut piece and tape to back of the die cut then with foam tape line back of cut piece and adhere to card base. With the rectangle die, cut out the slits from the die and wrap ribbon around this piece and again with foam tape line back of die cut and adhere to the card. Next is the bow elegance die cut piece again placing foam tape on the back and adhere to card. Tie a bow and glue to your card, and embellish if desired. 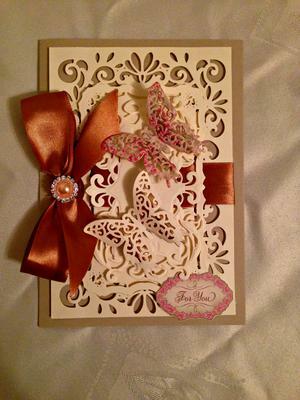 Die cut butterfly from Spellbinders Les Papillions and layer together place the butterfly on you card front and your sentiment. I also like the color choice and it would be suitable for many different occasions and even as male card if you didn't add the bow.